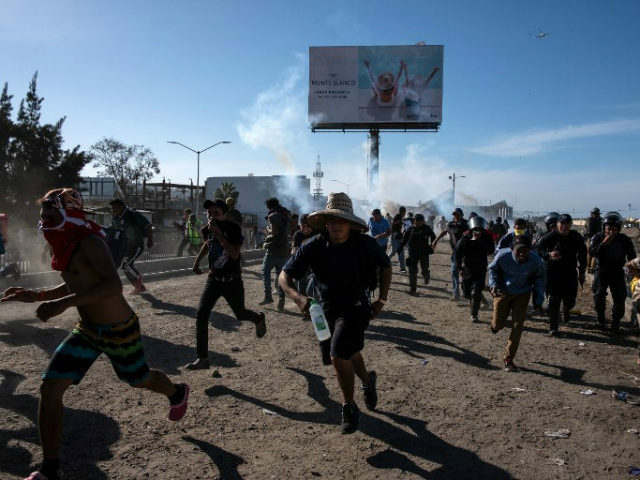 After the media repeatedly assured us it would never happen, hundreds and hundreds of migrants tried to invade our country Sunday by storming the American border. Some threw rocks and other projectiles at U.S. Border Patrol. Others proved just how political all of this is by chanting, “Yes, we can” and flying the flag of their home country. Thankfully, President Trump had prepared for this well in advance. Early last month, as thousands gathered in Central America to form caravans headed for the U.S. with the explicit intent of entering our country illegally, Trump deployed thousands of American troops to reinforce our border fencing and aid border personnel with other logistics. And while all of this was happening, the establishment media relentlessly and deliberately misled the American people. Acosta also said these migrants would never try to break in. “Your campaign had an ad showing migrants climbing over walls and so on, but they’re not going to be doing that,” Acosta said. And then Acosta repeated the bizarre talking point we heard throughout much of the media: “They’re hundreds of miles away, though. They’re hundreds and hundreds of miles away,” he argued. “They’re not coming,” screamed Joe Scarborough. Over and over and over again, we heard the same talking point throughout all of the media: “The caravan is 1,000 miles away!” And now we know this was simply propaganda, a deliberate attempt on the part of the media to gaslight us into believing that the President of the United States planning and preparing in advance was somehow a bad thing, that getting the country and border hardened while there was still plenty of time was somehow foolish. Yes, the same media who want the U.S. to immediately adopt socialism because of what might happen in the year 2050 were arguing that Trump should do nothing to reinforce the border because it would take weeks for the caravan to get here. And because Trump dared to prepare in advance, again and again and again, all across the media spectrum — including the increasingly dishonest Fox News — Trump was slammed as a racist and fear-monger who was using our troops as “props.” And now, here we are, less than three weeks later, and everything Trump (thankfully) prepared for, did happen. And then there was the ad. Remember Trump’s “racist” ad the media refused to air because it was too “sensational”? And why was it “sensational”? Because the 30-second commercial warns of an “invasion” of migrants as the caravan approaches. “This ad violates Facebook’s advertising policy against sensational content so has been rejected,” a company spokeswoman said after denying the President of the United States, the only person in the country chosen by the country to speak for all of us, the ability to run the ad on Facebook. CNN refused to air the ad, as did NBC, as did the eunuchs at Fox News — the very same Fox News that did allow open borders extremist Jorge Ramos to come on the air and mislead Fox viewers with his fake news about the caravan. “There’s no invasion here,” Ramos told us. And how are the media handling the fact that their lies and propaganda have been exposed by reality? Are they humbled, apologetic, eager to regain their credibility with the public, and admitting Trump was 100 percent correct and they were 100 percent wrong? …or they are attacking Trump for using non-violent means to stop hundreds of invaders (some of them violent) from invading our country. In these illegal caravans, Democrats and the media see future Democrat voters, while narcissistic millennials see exploitable labor — a future of their own filled with cheap nannies, housekeepers, maids, and groundskeepers.